Not only are we a tobacco superstore, but we also carry an extensive collection of electronic cigarettes in a variety of shapes and sizes. With a full-range of ejuice flavors and accessories, Smokers Choice is dedicated to helping smokers of all kinds. As a company that embraces choice, we support your choice to make the switch! Vaping is when you use heat to atomize an e-liquid, leaf or wax for the purpose of releasing nicotine or scents to be inhaled. Vaping the liquid, leaf or wax means that it is not actually burning, therefore it produces no smoke, ash or tar. Most people agree that vaping is healthier for that reason. Because leaves/herbs/wax and e-Liquid are vastly different in how they are vaped. There are 2 distinct categories for Vaporizers: Dry Herb (or Wax devices), and e-Liquid devices, commonly referred to as eCigs, eCigarettes, vapes, APVs (Advanced Personal Vaporizer) or Mods. These devices usually have the ability to switch tanks, allowing you to use the Vaporizer as an eCig or Dry Herb vape. Other nicotine vapes can come in the form of a “pen” or AIO (all-in-one) device that allows cartridges or pods to be interchanged and discarded. 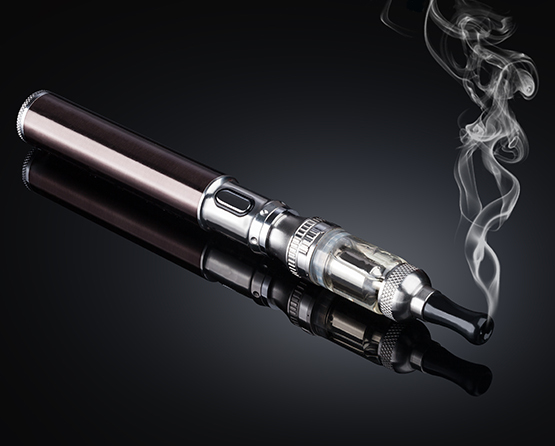 Electronic cigarettes, or eCigs, refer to all vaporizers that use e-Liquid (liquid nicotine). The smallest of these devices are disposable or utilize replaceable e-Liquid cartridges (pens or AIOs). However, the majority of devices utilize two separate pieces; a battery and a tank. The e-Liquid tanks allow users to refill their eCig with e-Juice flavors and brands of their choosing. E-Liquid tanks also have replaceable atomizers. Replaceable atomizers are meant for you to continue using your eCig indefinitely and only regularly purchasing eLiquid and additional atomizers. Though tanks and batteries have a wide range of costs depending on size and quality, buying replacement atomizers and e-Juice are typically cheaper than smoking cigarettes. e-Liquid is the fluid that contains varying levels of nicotine and flavoring in an eCig or Vaporizer. Some devices use disposable cartridges, while others, like those that you see producing large vapor “clouds,” use refillable e-Juice tanks. The juice itself is made from few ingredients. Besides liquid nicotine, they contain natural and/or artificial flavors, Propylene Glycol (PG), and Vegetable Glycerin (VG). The levels of nicotine vary to allow for one to wean them self off when trying to quit smoking. Vegetable Glycerine (VG) - A colorless, odorless liquid that is produced from plant oils, typically palm oil, soy, or coconut oil. VG is the ingredient that creates vapor clouds. Propylene Glycol (PG) - A colorless liquid which is nearly odorless but possesses a faintly sweet taste. 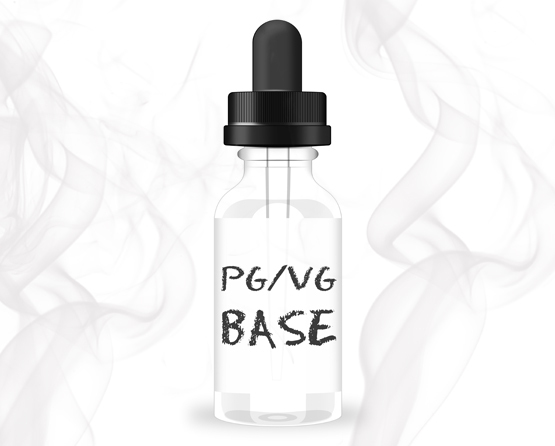 PG is used often in food and is the ingredient that carries the flavor of the ejuice. 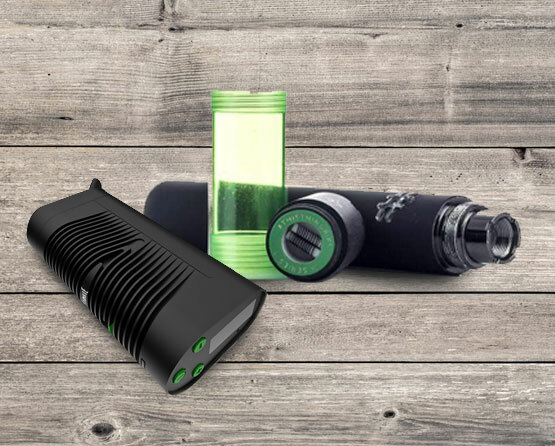 Starter kits usually include vaporizers commonly referred to as “eGo Style” devices, or simply “pens.” These are the simplest of devices and usually come in kit form including a battery and tank designed to work specifically with that battery. If you would like to try vaping for the first time, this is a great place to start as they are inexpensive and easy to use. Other starter kits include “AIO” devices (all-in-one) or, "pod systems." These closed-end vape systems are a great entry-level vape and use higher level salt nicotine for a smooth, enjoyable experience. Pod systems usually come in kits and include a vape battery, disposable cartridges (sometimes called pods), and a charger. Pod systems are popular among people trying to quit because it allows the user to mimic the feel of a traditional cigarette. Box Mods are the vaporizers you see which are smart phone size/shaped devices. 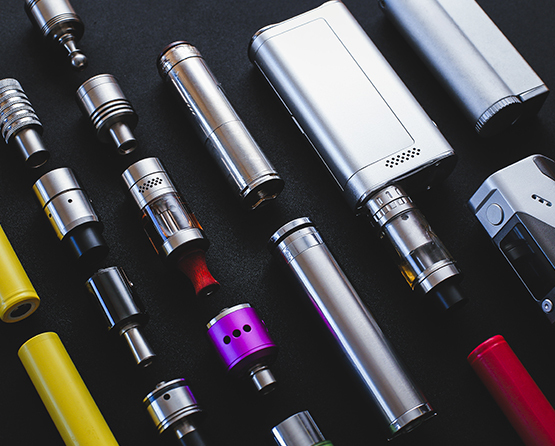 These types of devices are required for the use of sub-ohm tanks because they have higher, adjustable wattage or lack regulatory circuits altogether, allowing the atomizer to draw as much power as it needs directly from the battery. Because of their increased size these types of devices sport much longer battery life as well. If you want to produce the largest possible vapor clouds, you will need a box mod with a Sub-ohm tank. Mechanical or Mech Mods are most often used by experienced vape enthusiasts because they offer the most control over your vaping experience, however, they are not controlled by electronics; there are none inside a mech mod, it is a completely mechanical device. Users of mech mods customize the amount of vapor their device produces by building custom coils in their atomizers. The coils draws directly from the battery all the power it needs to heat up. Battery life with these devices is dependent on how much power is required to fully heat the coils you build. The bigger the coils the shorter the battery life. Because these devices require a knowledge of vaping and do not contain safety circuits that protect the battery from shorts, they are not recommended for new or inexperienced vapers. The biggest difference between mech mods and the typical mods you see in the store is that mech mods are “unregulated”. Commercial PVs (personal vaporizers) are built with chips between the battery and the coil that protects the user from over-discharge and short circuits. Regulated mods are built to detect issues before they happen and shut down the device to prevent any issues. Unregulated mechanical mods however, are not constructed with these same safety features, making them more dangerous than regulated devices. Regulated mods are what they are - what you get out the box is typically what you can expect. The only real customizable elements are replacing the battery with another, or changing to a different coil (if your device accepts multiple coils). However, unregulated mods can be built with a variety of options from small one-battery units to large multi-battery units with custom RDAs. Mechanical mods are generally safe if used correctly. It is important for the user to know and understand Ohm’s law and how it applies to vaping before trying a mech mod that being said However, if Ohm’s law is understood then many of the faults that do happen are as a result of the battery. As mentioned, mechanical mods do not have any circuit boards, so there is nothing to keep the device from fully defecting if there is a malfunction. Batteries can become defective in a number of ways, causing them to over discharge, misfire, overheat, and potentially burst. e-Liquid Tanks can come in dozens of varieties so it can often be hard to choose the best one for you. Only certain tanks will work on certain batteries, but our helpful staff at one of our many Smokers Choice retail locations throughout New York and Pennsylvania can assist you in determining which tanks will work for your device or vice versa. Tanks come in various sizes designed to hold different amounts of e-Juice at a time. They also differ from each other in that some have control over airflow, which will allow you to customize how much vapor it produces. Tanks utilize replacement atomizers that can come in various sizes. The larger the coil in an atomizer, the more vapor it will produce. Tanks with the largest coils are known as “Sub-Ohm” tanks. Sub-Ohm vaping is when you use a tank with an atomizer of a resistance rating lower than 1 ohm. Ohm is the unit of measurement that determines the resistance of a coil in an atomizer. Resistance correlates to the size of the coil, gauge wire used and number of wraps on the coil. This means that the lower your resistance rating, the more flavor and vapor clouds you’ll get out of your tank. RTAs & RDAs - Both RTAs and RDAs are rebuildable atomizers, or RBAs. They usually have a connector pin, a base, body, top cap and a drip tip. The deck contains a coil(s) and some sort of wicking inside. These atomizers are screwed onto a mod used for vaping. RDA - RDAs, or Rebuildable Dripper Atomizers, are used by vapers who “drip.” It’s known for being a “dripper” because it doesn’t store eliquid. Users will saturate the wicks by “dripping” a small amount of eliquid through the drip tip at a time. Serious vapers prefer this method due to the vapor and flavor production. RTA - RTAs are Rebuildable Tank Atomizers, and are much different than RDAs because they have tanks to hold the e-liquid. The parts are similar to an RDA, though everything in contained inside of a tank, which connects to a chimney that extends to the drip tip. Vapers like RTAs because they have an e-juice tank to hold their liquid, resulting in longer vaping. Dry Herb or Wax vapes are usually self contained devices with a battery and chamber for putting your herbs or wax in. Devices with replaceable atomizers are used for wax and oils while those that do not use an atomizer are for Dry Herbs only. eCigs able to use different tanks can use Dry Herb and Wax tanks as well, though the best devices for dry herb vaping were designed for that exclusively. E-juice explained: What is e-juice? 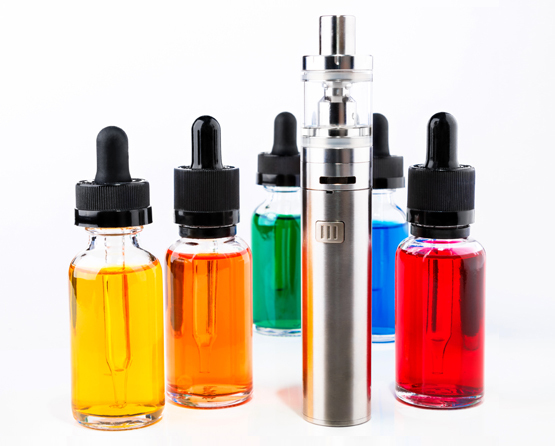 The e-juice, e-liquid, or vape juice, is the fluid that is used in vaporizers to create vapor clouds. E-juice contains a base liquid, nicotine, and flavorings. These juices come in a variety of blends, flavors, and nicotine levels. Nicotine levels can be identified by looking for the number of MG in the product, or milligrams. These are commonly seen in forms of 0mg (meaning no nicotine), 3mg, 6mg, and higher. The higher the number is, the higher level of nicotine is in your e-juice. Aside from the optional nicotine, there are 3 other ingredients included in e-juice. The liquid is made of a blend of Vegetable Glycerin (VG) & Propylene Glycol (PG), and flavoring. VG/PG is the base that is used to help distribute the flavor and nicotine throughout the liquid and controls the vapor production. Vegetable Glycerine (VG) - A colorless, odorless liquid that is produced from plant oils, typically palm oil, soy, or coconut oil. VG is the ingredient that creates vapor clouds. It is used in many scenarios like cough syrup, creams, food, and many others. Propylene Glycol (PG) - A colorless liquid which is nearly odorless but possesses a faintly sweet taste. PG is used often in food and is the ingredient that carries the flavor of the ejuice. It is used in many settings, including smoke machines, pharmaceutical solvents, sunscreen, shampoo, lotions, and pet food preservatives/stabilizers. Generally, VG/PG makes up about 90% of your e-juice. The other 10% comes from flavorings and/or nicotine. Controversial rumors surround the debate of vaping and it’s safety. There is limited evidence on the inhalation of these substances, but in a study on animals, research suggests it is very low-risk, especially when compared to the 7,000+ chemicals found in cigarette smoke. 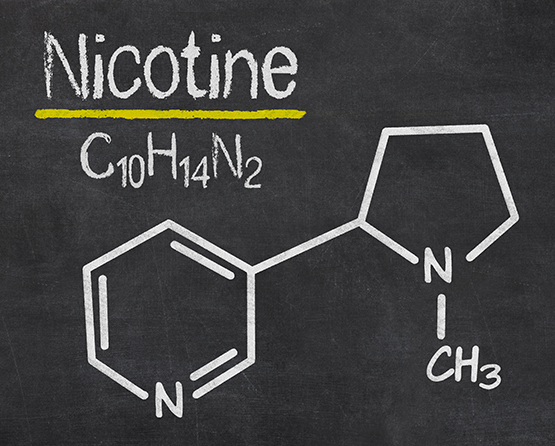 Almost all e-liquid contains nicotine, but not always. Zero nicotine options are available, but generally, e-juice comes in various nicotine strengths that can help smokers wean themselves off cigarettes and/or quit nicotine all together. The strength of nicotine in e-juice is almost always measured in milligrams (weight) per milliliter (volume); or mg/mL. Traditional nicotine is extracted from tobacco plants and then put into a “freebase,” meaning it’s purest form. Recently, a new type of nicotine hit the vape market called “Salt Nicotine,” or salt nic. 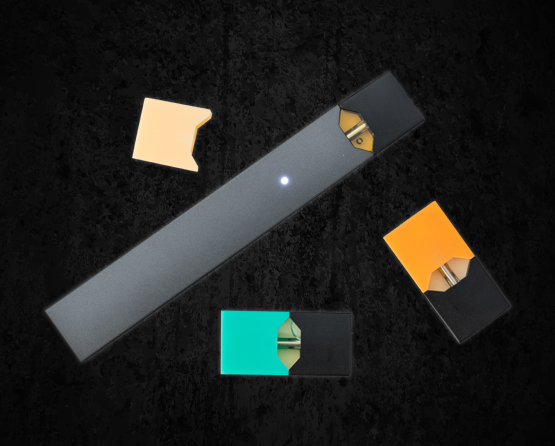 Salt nic gives users the ability to smoke higher levels of nicotine without the harsh throat it. It goes through a different extraction process and is meant to be used in low-wattage systems for a smoother, more enjoyable vape. E-liquid comes in a wide variety of flavors. E-liquid manufacturers may use artificial or natural flavorings, depending on the end result they are trying to receive. Common flavors include vanillin (vanilla flavor), linalool (herbal flavor), ethyl maltol (sweet, pastry flavor) acetyl pyrazine (graham-cracker flavor) and malic acid (sour and fruity flavor). Generally speaking, flavorings are safe to inhale and as they are food-grade substances. Some popular flavor profiles include: Beverages, Candy, Dessert, Cereal, Fruit, & Tobacco. 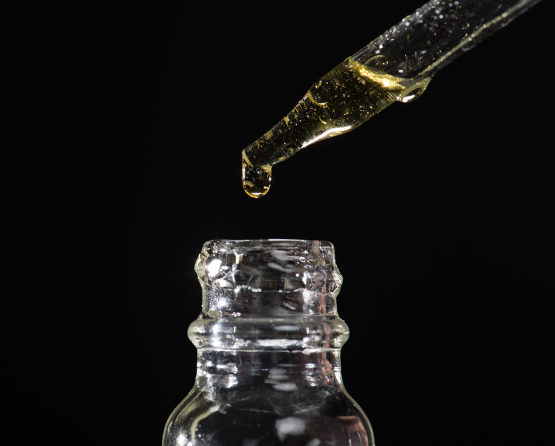 CBD stands for cannabidiol, a compound that is extracted from the cannabis plant to achieve a wide variety of medicinal and therapeutic effects. CBD has no psychoactive properties because it does not contain THC, so it doesn’t get you high. Although it is legal in most states, evaluations have not yet been made by the FDA. E-juice companies have recently started making CBD e-liquid so that it can be consumed by vaping. The properties are the same except instead of nicotine, it’s CBD. 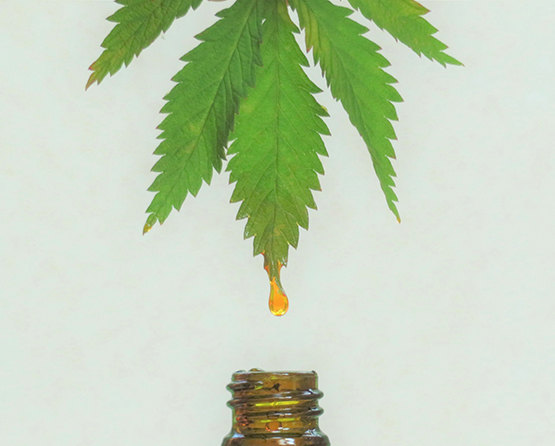 CBD can also be seen in other forms, such as creams/lotions, capsules, and edibles. To learn more about CBD, visit our CBD page. Interested in making the switch? We can help with that! View our Quitting page and learn how vaping can benefit you, and your wallet.